The private software license increasingly supplants public law. Courts have upheld software license terms that bar the sharing of public domain information. They have given effect to terms that prohibit reverse engineering, even when it qualifies as fair use under the Copyright Act, and terms that override the interoperability exceptions of the Digital Millennium Copyright Act. Software licenses can also nullify basic warranties under state commercial law. Software companies even successfully rely on licenses to access users’ machines in ways that otherwise would violate the Computer Fraud and Abuse Act. Despite early doubts about the enforceability of end-user licenses, legislation by license is now embraced not only by the proprietary software industry, but also by the free and open source community. The Open Source Initiative currently approves more than 60 different open source licenses. These include the GNU General Public License, which rivals the proprietary end user license agreement in length and complexity and functions as a private “copyleft” act. 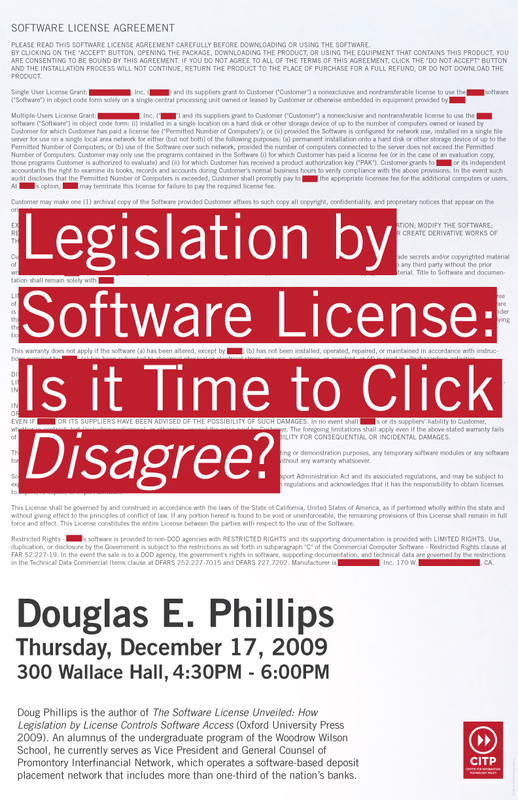 Douglas E. Phillips suggests that, although users have little choice but to accept software licenses, policymakers should reconsider whether opaque and largely unread license terms should control distribution of software and other digital works. Distributing almost any other product to end users consists of selling it and therefore transferring a known and predefined bundle of rights. The strings-attached software license, whether proprietary or free, ties up software in a web of privately-written rules. A potential alternative to the proprietary EULA is not an anti-EULA, but a distribution model that is standardized, straightforward, and largely license-free. 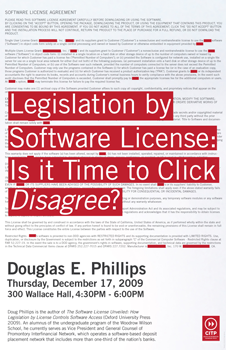 Doug Phillips is the author of The Software License Unveiled: How Legislation by License Controls Software Access (Oxford University Press 2009). An alumnus of the undergraduate program of the Woodrow Wilson School, he currently serves as Vice President and General Counsel of Promontory Interfinancial Network, which operates a software-based deposit placement network that includes more than one-third of the nation’s banks.